Tonight, the citizens of the Republic of Macedonia, through their representatives in The Parliament, accepted the constitutional changes and wrote a new historical chapter of our statehood. It is an act of statesmanlike responsibility and strong patriotism because it facilitates the two greatest state interests – the membership in NATO and The EU, to happen. Taking into account the most important interest of the citizens, the members of Parliament voted for implementation of the Final Agreement that enables international integration and acknowledgement of our country as a sovereign state. The accomplishment of these benefits came about through specifying the name of our country with a geographical adjective – The Republic of North Macedonia. Meanwhile, the Macedonian language will be internationally recognized in all unions. Our anthem and our flag remain the same and will be protected. Our citizenship will be Macedonian/Citizens of the Republic of North Macedonia that does not determine or predetermine ethnicity. Today, we have opened a new, bright, prosperous future for all the citizens of our country, for the good of our children. For a peaceful, safe country, where the Macedonians, the Albanians, the Turks, the Vlachs, the Serbs, the Roma, the Bosniaks and all other ethnic communities will live a better and prosperous life. 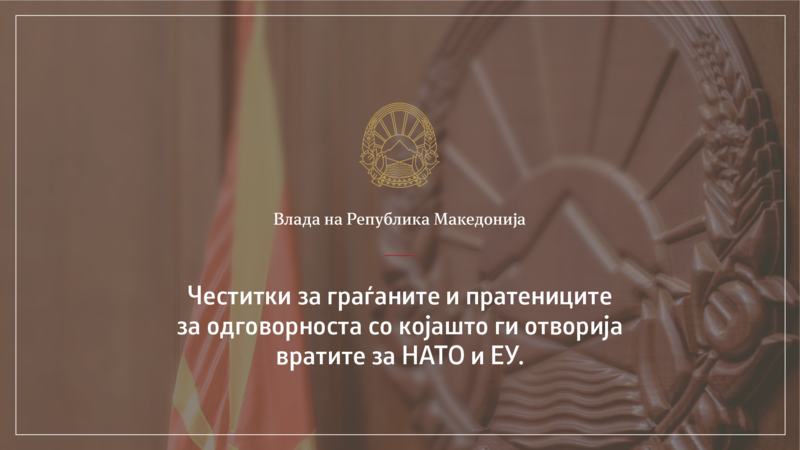 The Government of the Republic of Macedonia expresses gratitude to all citizens and to all supporters and partners of our country, for the great and significant support through the whole process of accepting the Prespa Agreement, with which we are securing our country’s future as member of NATO and The EU.